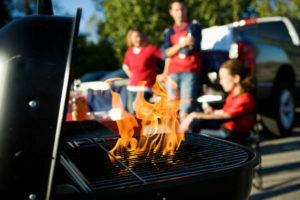 Learn how to keep your tailgate safe with these tips! Whether you’re partial to the NFL or the NCAA, football season has begun. It’s a time to get out the cooler and the grill and enjoy watching the game with friends and family at a tailgate. However, as you get ready for your watch party, ensure that you’re conscious of safety. Do all that you can so that everyone has a good time safely, and check out these football tailgate safety tips. Grilling and tailgates go hand and hand. However, without a refrigerator nearby, you’re left bringing your perishables in a cooler. While the cooler helps to keep your food safe and ready to eat, it only lasts for so long. Once the food has sat out for too long, it’s no longer okay to eat. Remember to pay attention to your food and its temperature so that you can prevent and food poisoning mishaps. You may want to enjoy the game with a drink or two. However, it’s important to watch your alcohol consumption. Don’t over do it, NEVER drink and drive, and remember to balance your alcohol consumption with water. For every one alcoholic serving, you should drink the equivalent in water. Even as it starts to get a bit chilly, the sun can be dangerous during your tailgate. Remember to bring adequate sun protection and drink lots of water. That way you can prevent a sunburn and reduce your risk of dehydration. Store Your Valuables Away Safely. You may be tempted to bring your valuables with you, but it’s best to leave them at home. If you must bring an item or two, stow it away out of sight and keep your essentials with you at all times. Enjoy your tailgate safely. Enjoy life safely with the right insurance. Contact the professionals at Robert J. Los Insurance Agency to find you the right insurance. Located in Hamburg, New York, we serve all your personal and commercial insurance needs.